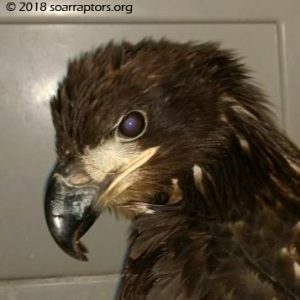 Cass County Naturalist helped out SOAR and rescued an injured bald eagle along IA-92 in her county. This hatch-year female has a fractured right humerus and is a bit thin. SOAR could not do all that we do without help from other conservation staff and members of the public. Thank you! This youngster has improved and moved to a 10x20 flight room. Moved to the 20' x 60' flight pen in preparation for a soft-release.